One of the best parts of summer is being able to go swimming so that you can escape the heat, but water is still the mortal enemy of many electronics. Even though many modern phones now feature some level of water resistance, they’ll typically be rated for very brief immersion, and only in freshwater. Throughout this review guide, we’re going to cover five of the best waterproof phone pouches on the market , and we’ll also provide you with some buying advice to help you find the right one. These products were selected because of their superior value for money, reliability, and ease of use. 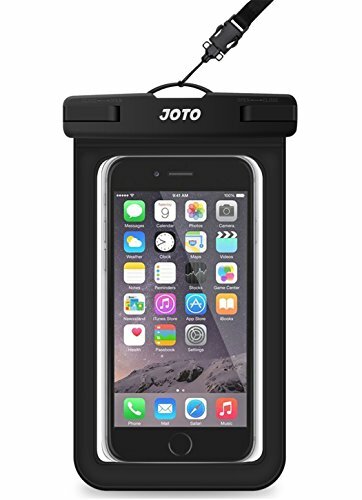 The JOTO Universal Waterproof Pouch is one of our favorite products in this category thanks to the excellent value for money that it offers compared to the competition. This case is designed to remain watertight, and it did so in all of our tests, regardless of the kind of water that it was submerged in. However, we have a suspicion that salt water will damage it over time. Getting several different phones into the case wasn’t a challenge, and we tested popular models including the iPhone XS, iPhone 8 Plus, Samsung Galaxy S9 Plus, and more. The snap-and-lock system used on this waterproof pouch helps keep it secure from water infiltration, but opening it and closing it will hurt your nails after a while. One of the only major downsides of this waterproof pouch is that its lanyard is of inferior quality when compared to the competition. The cord is too thin, and it digs into your neck, particularly with heavier phones. However, the security and the reasonable price point of this pouch make it a great choice. This pouch from YOSH offers improved protection due to the fully enclosed hemming around the periphery. This additional layer of security helps ensure that this pouch won’t be infiltrated by any water for up to two continuous hours of submersion. We confirmed this through tests of our own, and the case stayed dry for three hours. The hemming is also designed to be ergonomic, and it is soft to the touch, giving you a comfortable edge from which you can hold the pouch. One of the main benefits of this waterproof pouch is that photos and videos are surprisingly clear, but you’re going to want to keep the flash off to ensure that there is no blinding glare in your photos. While this case’s compactness makes it more portable than other models, it also makes it incompatible with certain phones, such as the iPhone XS Max. The only other issue you may run into while using this bag is some difficulty swiping, but you won’t run into any problems that a second or third swipe won’t be able to fix. Perhaps the best feature of the TeaTronics Floating Waterproof case is the TPU material that the viewing window is made out of. Throughout our review, we had few issues swiping and using the home button on phones where it is touch-sensitive, such as on the iPhone 8 and the iPhone 7. The durability of this case was one of the better features, and we noted that it could withstand scratches from car keys and other items that you may commonly find in your pockets. Another benefit is that you get two of these cases for a marginally higher price than many of the other offerings on this list, improving value for money. Unfortunately, this case is not without its downsides, and one of the most glaring issues is that it doesn’t float if your phone is too heavy. This is a pretty serious issue when you realize that this case is designed to fit some of the largest phones, as it is compatible with devices that are up to 6.5” diagonally. 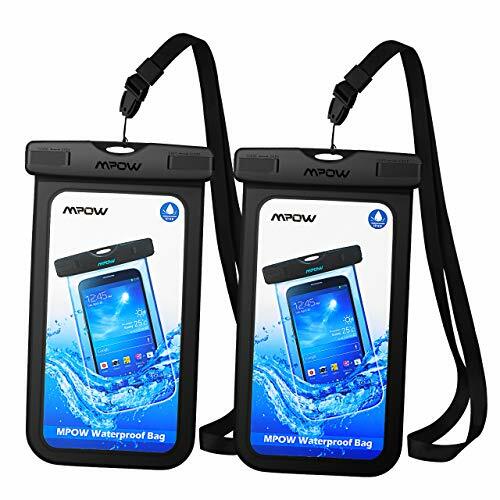 For those of you who are looking to save as much money as possible on the best waterproof phone case, then this 2-pack from Mpow may be the right choice for you thanks to its affordable price. Unlike other low-cost options, this is phone pouch is highly reliable, which we managed to prove through our rigorous tests. We followed the manufacturer’s advice and submerged this case in 0.5 feet water for eight hours with a tissue inside of it, and we found no signs of leaks after taking it out. Keep in mind that this case is capable of being submerged far deeper, with a maximum immersion depth of 49 feet, which is admittedly shallower than some competing products. However, this case also comes with a quality lanyard that is surprisingly comfortable to wear around your neck, even with heavier phones in the case. Speaking of larger, more massive phones, you may have some difficulty getting 6.5″ phones like the iPhone XS Max into the case, even if it is supposed to be able to fit them. Last but not least, we have the Vansky Floatable Waterproof case, and as you would guess from the name, one of our favorite aspects of this case is that it floats. Unlike other models, where you may have to dive to the bottom to retrieve your phone if you drop it, this one will simply bob right up to the top, reducing the likelihood that you will lose it. Another unique feature of this case is that it features an external audio jack, meaning that you won’t have to take your phone out of the case to listen to music while at the beach or pool. The armband design is great for running at the beach.This waterproof phone case is also user-friendly, as the locking tabs don’t hurt your fingers when you use them, like on many competitors. While the compact size of this waterproof case may be attractive to some buyers, others will be disappointed because it can only fit phones up to 5.7″. Another issue is that the touchscreen becomes hard to use while submerged. Thankfully, this model performed well in our water test, withstanding a half foot of water for several hours without being compromised. To determine the performance of each of these waterproof phone pouches, our testers used them in a wide range of conditions to assess their capabilities. These pouches were used in freshwater lakes, chlorinated pools, and saltwater beaches to determine whether or not they provided the required protection. Let’s go over some of the aspects we analyzed in our reviews. Value is one of the key aspects that you’ll want to consider when buying the best waterproof pouch for your phone, and it can be determined in several ways. When we test the value of a case or pouch, we often compare the price point to the capabilities and features of the product, with models that offer more for less coming out on top. For example, a seven-dollar case that comes included with a lanyard and an additional warranty will be a preferable choice when compared to a 12-dollar case that comes with neither. Another consideration is the number of cases that come included for the price, as some will come in packs of two or more. The two best choices on this list when it comes to value for money would have to be the TeaTronics Floating Case and the Mpow Universal Case, as they both come in packs of two. 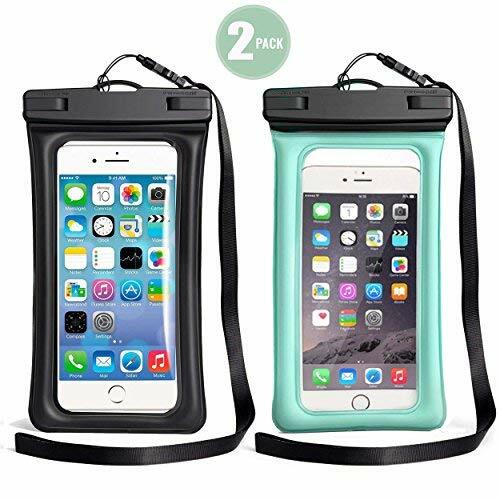 Even though they are available in two-packs, both of these waterproof pouches are available for only a slightly higher price than others. Keep in mind that certain features will offer more value than others. A waterproof case that comes with a guarantee to replace your phone will provide immense value, as it can save you over a thousand dollars. The IP rating determines a product’s resistance to infiltration from two different substances, and it is represented by a four-digit score in the form of IPXX. The first number represents the defense against particulate matter like dust and sand, and it ranges from 0 to 6, while the second is water resistance and it ranges from 0 to 8. We tested the water resistance of each of these products by submerging them in half a foot of water for the period recommended by the maker. Every product except for the Mpow case is capable of withstanding up to 100 feet of water, while that particular model can take the pressure at down to 49 feet. Every one of the waterproof pouches that we tested out featured a rating of IPX8, which means that they have not been tested with particulate matter, but can withstand immersion in water of 1 meter or more. As you would expect, the IP rating is one of the first things that you’ll want to account for when you’re looking for the right case. If you tend to dive or if you tend to drop your phone at inopportune moments, a higher IP rating may end up saving your device from the murky depths. Every waterproof phone bag is compatible with a range of phones, and the main restriction is typically the size of the pouch. Phones are now larger than ever, and protective cases from a few years ago may simply be too small to fit the newest devices on the market. To test compatibility, we simply put the phone in the case and saw how much of a challenge it was to fit it in. Some of the cases we reviewed wouldn’t work with particular phone models, as you would expect, and the iPhone XS Max fit in the fewest pouches. This is due to the phone’s massive 6.5″ diagonal size. The TeaTronics and the JOTO models fit the iPhone XS Max, but there was difficulty fitting it into the Mpow, which is supposed to support it. The smallest product on this list is the Vansky case, which only fits phones that are up to 5.7″, but the smaller size also makes it easier to transport. Finding the right sized waterproof case is a matter of balancing a small enough size to be convenient and a large enough size to fit your phone. Finally, a larger case will also be able to fit some extras in it, like your credit card, some cash, or even a passport. The degree of protection afforded by your waterproof pouch for iPhone ties into its IP rating, but determining it is a more complicated matter because you have to look at the entirety of the product. 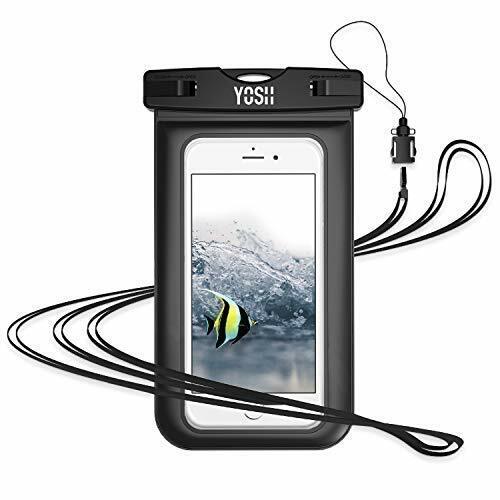 For example, the protection of your waterproof case will largely depend on the locking mechanism that it uses. There are various types of locks, but levers and latches are the most common choices, with the former typically being harder to use. Some cases will also protect against more than just water, with some of them offering resistance against sand, scratches, dust, and snow. You’ll also want to take a look at how durable the locking mechanism is, as you won’t want it to fail while your phone is underwater. The material that your waterproof pouch is made of is another thing to account for, with options like TPU being preferred over other synthetic materials thanks to their capacitive compatibility. The waterproof case from Mpow offers the most varied protection out of any model on this list, as it is scratch-resistant as well as water-resistant. The unique dual swivel lock can creates a secure seal. However, it accomplishes this at a price, as it can only be submerged in water that is half as deep (50 feet) as the other options that we reviewed in this guide. Usage refers to how easy it is to use the waterproof pouch and your phone when it is inside of it. For example, you’ll want the locking latches and switches on the case to be easy enough to use without hurting your fingers. Unfortunately, the tight seal required by these cases will often make them harder to open and close. Many waterproof cases also feature poor touch recognition while they are submerged, so if you’re looking to take pictures and videos under the waves, you’ll need a window made of TPU or another synthetic material. Keep in mind that TPU won’t make up for air pockets between the window and the phone, which can cause a touch screen to become unreliable. Another thing to account for, if you’re planning on recording while submerged, is the clarity of the rear window. While the material will contribute to making photos and videos come out clearer, you’ll also want to account for the space between the camera lens and the rear window. Joto’s waterproof phone pouch has great window visibilty for photo taking. The JOTO, YOSH, and Mpow products all feature excellent touch screens that are surprisingly easy to use while submerged, while the TeaTronics and Vansky models are the opposite. However, the Vansky model makes up for this due to its implementation of latch-type locks that are easier to use. 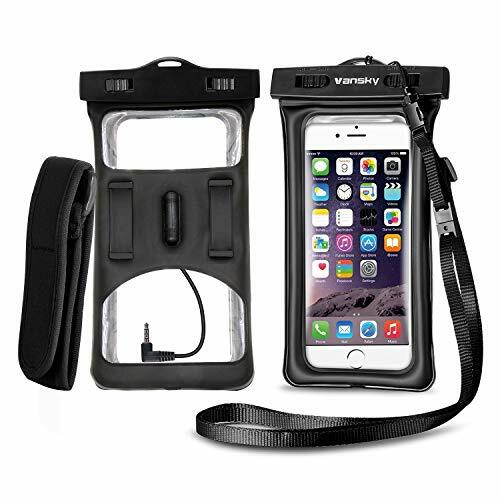 As you would expect, it can be a challenge to find the best waterproof pouch for iPhones and Android phones or devices from any other manufacturer. Unless you test the product out yourself, you often won’t have any idea of what to expect from the model that you’re buying, so we hope that our reviews and the features rating chart below have helped you out. Finding the best water-resistant case for your needs is vital, as you may be entrusting it with a $1000+ phone, and an untimely failure can end up costing you. An affordable and resilient waterproof phone pouch can save you quite a bit of money when compared to traditional ruggedized waterproof cases, which can cost up to ten times more. Subscribe to Download our 7-Point Vacation Checklist (PDF) for FREE! This checklist saves you valuable time by preparing for any vacation, taking care of vacation finances, securing your home while traveling, dealing with work and family matters, and getting ready to embrace your trip. Subscribe and get instant access now! Price last updated on 2019-04-23. Links & images are from Amazon Product Advertising API. Our editors independently research, test and recommend the best products and services. We may receive a portion of sales from products purchased from this article at no additional cost to you. Got the JOTO for snorkeling last month and can confirm it’s doesn’t leak and take decent underwater photos. Fantastic test Jerry. It helps alot in my purchasing decision. What waterproof phone pouch did you buy in the end? Hope you find my in-depth testing useful towards your buying decision. Let me know if you need any more help. I only need one pouch. Is buying the 2 packs from Mpow worth it or should I save some money and just buy the Joto one? The Mpow is worth buying with the second one used as a backup. Or for your family members or friends who need the pouch too. Great comparison, also thinking of getting one to protect my damn big iPhone XS Max, haha. The TeaTronics Case would suit you well as it is the largest out of all the waterproof pouches.